386 pages | 13 B/W Illus. Although sequent calculi constitute an important category of proof systems, they are not as well known as axiomatic and natural deduction systems. Addressing this deficiency, Proof Theory: Sequent Calculi and Related Formalisms presents a comprehensive treatment of sequent calculi, including a wide range of variations. It focuses on sequent calculi for various non-classical logics, from intuitionistic logic to relevance logic, linear logic, and modal logic. In the first chapters, the author emphasizes classical logic and a variety of different sequent calculi for classical and intuitionistic logics. She then presents other non-classical logics and meta-logical results, including decidability results obtained specifically using sequent calculus formalizations of logics. The book is suitable for a wide audience and can be used in advanced undergraduate or graduate courses. Computer scientists will discover intriguing connections between sequent calculi and resolution as well as between sequent calculi and typed systems. Those interested in the constructive approach will find formalizations of intuitionistic logic and two calculi for linear logic. Mathematicians and philosophers will welcome the treatment of a range of variations on calculi for classical logic. Philosophical logicians will be interested in the calculi for relevance logics while linguists will appreciate the detailed presentation of Lambek calculi and their extensions. "Katalin Bimbo is one of the leading relevance logicians in the world today and indeed one of the leading non-classical logicians in general. 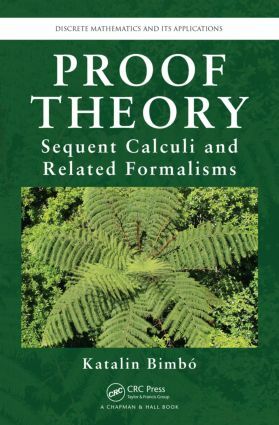 Her book on proof theory takes readers through standard (classical) proof theory and beyond, including proof theory for some of the most important non-classical logics. The discussion is brilliantly executed. All graduate students interested in logic should study this book and all faculty too. I plan to use the book often."